Welcome to my Medical Yoga Site! Are you searching for a deeper connection and healing on all levels? Explore self-growth, physical vitality, peace, and gratitude on all levels, Body Mind and Soul! Movement Medicine, Corrective Exercise, Breath-Work and Energy Healing to Prevent Disease. Medical Yoga with Holy Fire Reiki is the perfect combination that ignites the Soul while healing and balancing body and mind. Try a custom tailored one on one private practice. Guided meditation with Holy Fire II Reiki Healing energy work to heal straight from Source. All inquiries contact us: snyc.info@gmail.com or call 407.272.5011. Dr. Milescu offers an eclectic mix of services for self healing and wellness. Personal Development packages are offered with one on one training and consultations. Former elite level gymnast 1978-1989, and a retired Podiatrist from 1995-2012. She has a B.A. in Biology, a Doctor of Podiatric Medicine degree, and is currently a professor of Human Biology, and Anatomy & Physiology Lab at Daytona State College. Founder/Owner Serenity Now Yoga Holistic Wellness Center, Professor of Anatomy & Physiology at Daytona State College,. Certified Yoga Teacher each of them YA Alliance 200 and 300 hr programs, she trained in Hatha, Vinyasa, and Kundalini Yoga. Over 1,000 hours of Yoga training's, and 12 years of teaching Yoga. She is a former elite gymnast and athlete. She coached gymnastics from 18 years old 2009. Certifications: in Kids Yoga, Prenatal Yoga, Yogassage, and private yoga training. Dr. Milescu offers a variety of packages based on her background studies, degrees and diverse trainings. Are you on a path of personal development- physical, mental, spiritual, and holistic improvement of all facets in your life journey? Then Serenity Now Yoga Holistic Wellness offer unique elite personal development packages. These packages are designed to release the inner desires of any "seeker" to improve physical, mental, or spiritual personal development. 1. Elite Physique Package: Physical conditioning to complement any sport through yoga and gymnastics core strength and agility training. Dr. Milescu is certified in kids yoga. She has been coaching gymnastics on and off including competitive team level gymnastics, not recreational gymnastics. 2. Medical Yoga Package: to assist in post injury and chronic pain management gentle corrective exercise, teacher assisted stretching, restorative yoga with props and guided meditation. Designed for injured, chronic autoimmune disease, diabetics, heart disease, arthritis, and injured athletes. 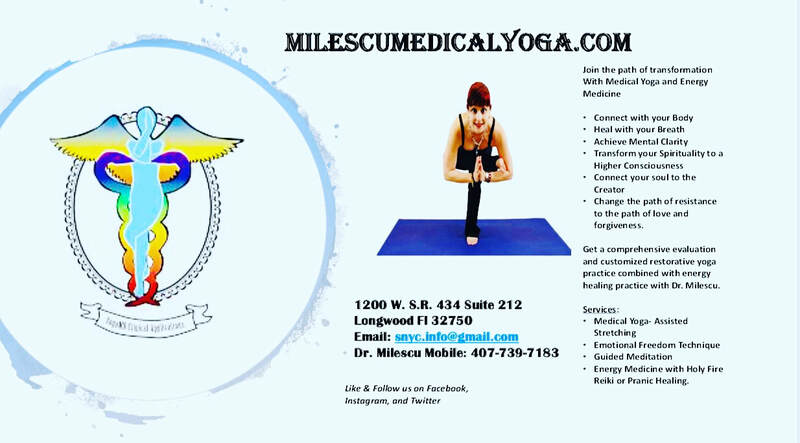 Dr. Milescu is certified in Prenatal Yoga, she therefore offers prenatal yoga via this medical yoga therapy regimen safe for all stages of pregnancy. 3. Holistic Metaphysical Energy Healing Package: crystal healing, traditional Japanese Usui Reiki method, advanced Pranic Healing techniques, guided intentional setting techniques through intention stones, vision boards, mantra, affirmations, guided visualization, and guided meditation journey's to assist in self- realization and spiritual development. Methods are eclectic from Metaphysical studies, Kundalini Yoga, and Energy Medicine studies. 4. Meditation for Stress Relief and Hypertension: 15 minutes to one hour guided journey through nature scenes and techniques to unplug from the outer world and discover the inner Self. Affirmation and mantra used as needed. Definition: the integration of a traditional detailed History and Physical Exam, followed by an assessment and plan of action as to concise prescriptive custom designed therapeutic Yoga program for a patient’s particular medical, psychological, spiritual, and wellness needs. 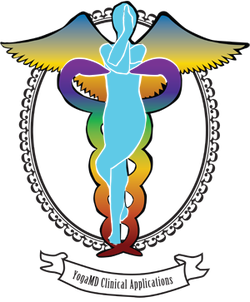 The Rx may include traditional Yoga & Meditation as well as Eastern Energy Medicine implementation of Chakras Meridians and Reiki Energy Healing, Tapping Meridians in conjunction with Affirmations, and Holistic Dietary Changes altering ones Physical Mental Spiritual and maintenance needs to ultimately change the lifestyle and alter the path of existence towards a higher Awareness. 1. Dacia has been a wonderful asset in helping me improve flexibility and maintaining health function. Over the years she has guided me in ways to modify yoga postures in response to my body's individual needs. She has helped bring relief from arthritis -related issues, easing their effect, particularly with back issues. Her warmth, empathy, and caring manner is most appreciated and evident in her timely response to getting an appointment saying flexibly, "Call me when you need me." Dacia's extensive knowledge of anatomy allows her to pinpoint areas of concern or discomfort with a seemingly sixth sense! I consider her a beautiful adjunct t o staying flexible and active and enjoying life. Thanks, Dacia! 2. I was in a near fatal motorcycle in December of 2006. I was in a comma and on life support for three weeks and in ICU for four weeks. I suffered compression of cervical joints C5, C6 and C7 and underwent decompression surgery. I suffered multiple rib fractures, fractured left clavicle, fractured left scapula, partial thickness tear of the left rotator cuff, multiple fractures to the thoracic section of my back and a fractured left pelvis bone. At the time of the accident I was 53 years old and in good physical condition. Since that time I have experienced chronic severe pain in my back, shoulder and ribs. The chronic pain has been rehabilitating. I have been to 2 chiropractors, 2 pain management specialists, multiple physical therapy specialists, and multiple massage therapists and to Jewitt Orthopedic to a shoulder specialist. I received very little help that lasted more than a few hours from any of the specialists. Out of complete frustration I searched for an alternative solution. I discovered Dr. Milescu’s website for Serenity Now Yoga. In December of 2011 I made an appointment with Dr. Milescu for private medical yoga therapy. I have been seeing her once a week since that time. No physical therapy has been as effective as the medical yoga therapy that Dr. Milescu performs. I am now able to go on with life without rehabilitating pain. I have also decreased my level of pain medication. 3. I would highly recommend this treatment to anyone who has moderate to severe chronic pain and has not found an acceptable solution. It has worked for me. I have increased mobility decreased pain gained strength both physical mental and spiritual. The guided meditation completes the session, making it the highlight of my week. I am able to be more relaxed focused and productive throughout my work day. ​Intelligent Motion with Medical Yoga!